In a large bowl combine your cruciferous greens blend, onlon, tomato, sunflower seeds and chopped up crispy bacon. If you need help on how to cook bacon, you might find this tutorial helpful. Place all of your salad dressing ingredients together in a mason jar. Put the lid on the jar and shake until the dressing has completely come together. Pour the dressing over your salad and work it into the leaves. Use your hands if necessary. Set the salad aside. Soft boil your eggs. I find that six minutes in boiling water tends to be my sweet spot for the perfect soft boiled egg. 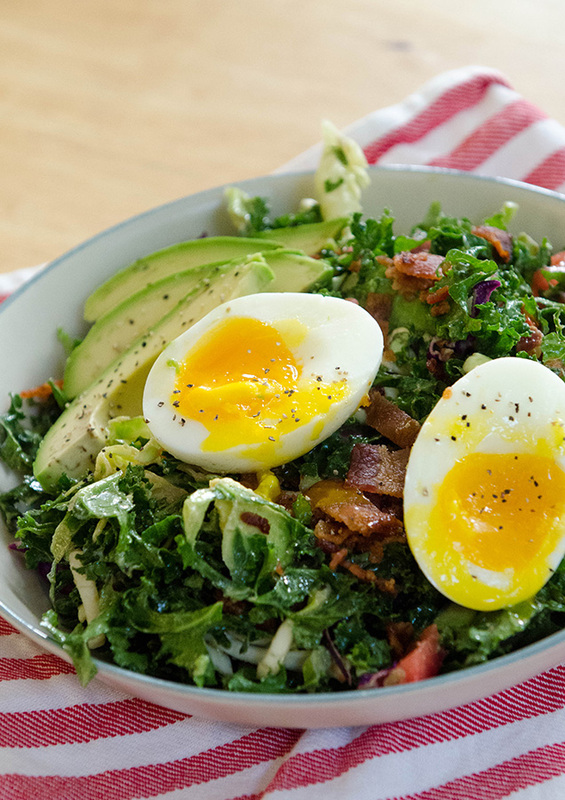 Once the eggs are done, peel them, slice them open and serve them on top of your salad with some avocado slices. © 2014 So...Let's Hang Out. All rights reserved.